100 years ago, Tove Jansson, beloved creator of the Moomin series, was born. Moomin is both a comic strip and a series of books that revolves around the lives of several plump white creatures that look like hippopotamuses. The Moomins live in Moominvalley, and go on fantastic adventures with friends. 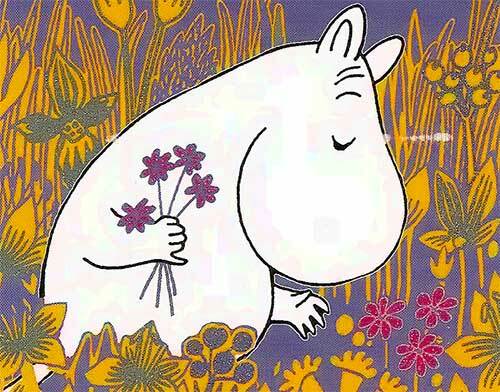 Since its inception, Moomin has exploded in a few countries around the world. There have been several television series produced around the lovable characters. In Naantali, Finland, there is a theme park named Moomin World. There exists a real-life replica of the robin-egg blue-colored ‘Moomin House,’ and many other buildings and shops from the fantasy world. Moomin became especially popular in Japan in the 1990s, when Dennis Livson and Lars Jansson created a lengthy (104-episode) series called ‘Tales From Moominvalley.’ After came a full-length film entitled ‘Comet in Moominland.’ Resonating with the soft and youthful kids entertainment culture in Japan, Moomin stuck – and became a cultural enigma. The Scandinavian feel and distinct Jansson art style was a refreshing and hypnotizing take on a children’s tale. With success in mainstream Japan, and consistent bestselling trends in Finland, Sweden, Latvia, Lithuania, and Estonia, Moomin has become a series powerhouse. The amusement parks, despite having no rides, have become top foreign tourist destinations. Moomin continues to find new ways to spread its joy. Recently, it was announced that the first Moomin theme park outside of Finland will open at Lake Miyazawa in 2017. Metsä, which means ‘forest’ in Finnish, will be situated in the Tokyo metropolitan area, in the city of Hanno. It is said that the area is very Moomin-y. As a Moomin fan, Kawaii-chan is very excited to see what is announced next!